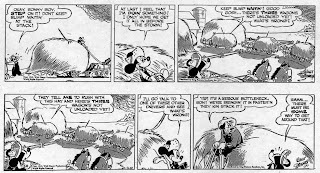 Back in 1942 KFS began to make the daily Mickey Mouse strip available in two different formats. One was a longer strip and the other one shorter, but with more artwork on the bottom of the strip. The originals were drawn like the shorter strips and to make them longer they simply cut off the bottom and enlarged them, thus creating two different versions from the same original. Get it? The earliest Mickey daily I've found two versions of is this one dated September 7, 1942. (Anyone seen an earlier example?) As you can see it was designed so that it easily could be cut off. No important details in the bottom of the strip. The rest of the week followed in the same manner, as you can see below. First we have some uncut versions and then two cut ones for you to compare. 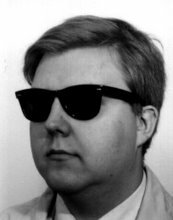 (Unfortunately the full sized all comes from baaad microfilm.) Notice that Mickey has been moved up a bit, to not be cut off in the second of these two dailies. But... the week that followed some odd strips appeared. Someone must have forgotten that the strips should be made in two versions. An what appeared in most papers was a cut version that looks terrible. The strip dated 9-14 even has the cut made inside the strip, resulting in the worst cut I've ever seen in a daily. Check out the samples below for the cut week. 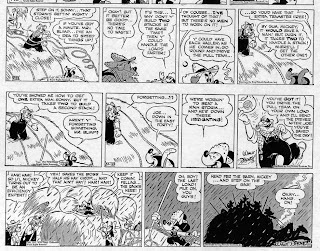 A while ago I was lucky to find really bad microfilm versions of these strips in their full version. (Only one paper of all I found that had MM ran the full version...) It appears that nor Disney or any other publisher still has the full version proofs anymore, so for now this is as good as it gets. After this week the strips were made in two versions that looked equally good again. While doing this research I noticed that these strips must have been available in a third (!!!) version. One without zip-a-tone. Look at the sample below. Does anyone know when they started this habit? Seems again that the only surviving stats are the ones with zip. Any comments, additions or further info on this subject is welcome! I noticed two versions of early 30's Mickey Mouse dailies (and later, sundays) - with or without balloons. The balloonless versions have all the text below the strip (a common practice in those days). Now, I can't say where they did the editing since I have only seen it in translated strips, but I have found at least *one* example where some art seems to be a bit different. Have you seen anything like that in your research? This would be the Swedish translated versions, right? I've never seen that happen in the USA so I believe that it was made to suit the Scandinavian/European market. 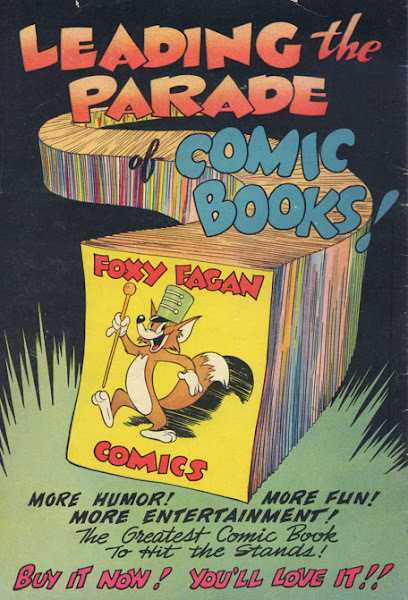 Gottfredson and his co-workers probably had no idea their stuff was altered for overseas publication. 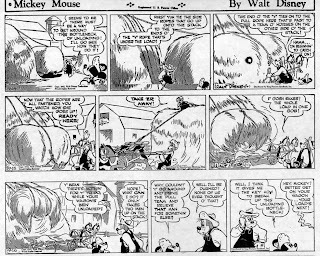 I believe that the three versions of the 1942 strips shown in the post were all made at the Disney studio. Yes. The first years in Sweden (and england.. I have an unconfirmed source for that) they published the strips without the balloons. If you have a look at Stockholms Dagblad (before Gottfredsson actually) you'll find the first few hudnred strips like that, and when I compare them to the balloon-version from Dagens Nyheter 1987 and The Gladstone reprints, there are subtle changes to accomodate for the lack of balloons (mostly backgrounds). Better you have a look someday since I'm not a pro, perhaps you can tell if ti's a different artist or not.